The Philippines probably has the longest holiday season in the world. We usually feel the Christmas spirit in September and it carries on until a week after the New Year. 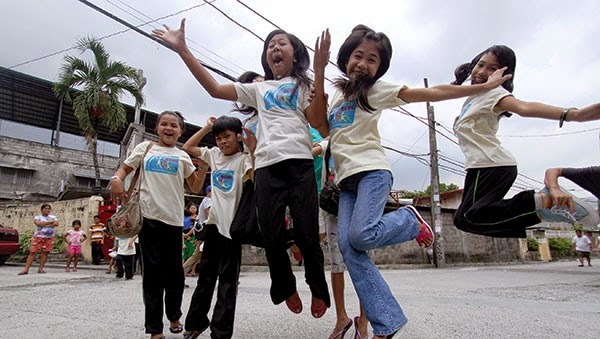 Filipinos love the revelry of the New Year and despite being deeply religious, we still believe in traditions deeply rooted in pre-colonization tribal practices; in Chinese, Indian, and Spanish culture; and local folklore. Modern times have debunked most of these beliefs; however, some still take it to heart especially during New Year celebrations. I am guilty of some; I guess it won't hurt to follow the customs and traditions that have been handed down from generations. Most may seem silly, and you may have to experience a typical Filipino family New Year celebration to believe it. 1. As a child, I was "forced" to wear a shirt or a dress with a polka-dot design. It is believed to bring wealth and good luck for the coming year. This may be attributed to the Chinese' love for round things which signify infinity. When I asked my grandparents for the reason why I had to wear a polka-dot shirt, my grandparents would say that it symbolizes money. The dots were supposed to be coins. So then, the next year, I stopped wearing anything with polka-dots. I did not want coins, I wanted paper money! That is when I started wearing striped shirts. 2. New Year's Eve attires did not end with wearing polka-dots. It was also required that our New Year's Eve attire should be predominantly red. It was believed that the color red is for good luck. Again, another trait we have imbibed from the Chinese whose custom is to hand out little red envelopes or "hong pao" during New Year. When I was young, I didn't care much about what my parents or grandparents made me wear on New Year's Eve. I just hated the fact that our family pictures made us look like the Von Trapp Family Singers - all wearing the same design of clothes - red with polka dots. 3. It is strictly forbidden to spend on the first day of the New Year. We should get everything we need for the house or for personal use before the New Year. It is believed that spending on New Year's Day would mean losing money for the whole of the coming year. Do not be surprised to see Filipinos raiding the grocery store or the wet market. It is our time to "legally" hoard goods. 4. We have to make sure that once midnight strikes on New Year's Eve, we have money in our pockets. This is believed to ensure that we will have money all year round. There was a time that I knew I slipped a 500 peso bill in my pocket, only to find out that I lost it as I joined in the revelry of welcoming the New Year. For the years after that incident, I only kept coins in my pocket. After all, there were no set rules about how much you should carry in your pocket. 5. To ensure that you would not go hungry in the coming year, it is a practice to fill the rice bin to the brim. Same goes with the salt and sugar containers. If you have a water reservoir, fill it too. Keep it full until after the first day of the New Year. 6. A fruit tray should be filled in 12 different kinds of fruit and placed in the center of the dinner table. This symbolizes 12 months of bountiful food for the family. My mother religiously abides by this practice. Come the second day of January, we would be "forced-fed" with the fruits that she bought. 7. 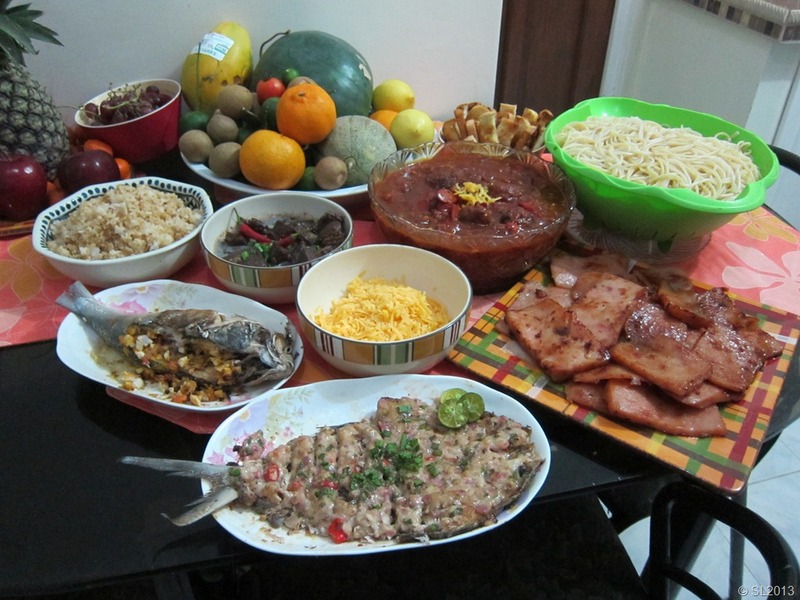 The family's New Year's Eve feast, called "Media Noche" (Midnight) is composed of dishes that are specially made, the result of hours and hours of labor in the kitchen. There are some requirements, though. There should always be something made out of sticky rice, to symbolize family togetherness. There should be fish, another custom inherited from the Chinese. Fish in Mandarin in called "yu" which also means "surplus" or "excess." Therefore, having fish on the dinner table on New Year would guarantee the family that they would have "more than enough." We are not supposed to have chicken or any winged animal. I have no idea where this tradition came from. It is believed that having chicken or turkey for New Year is bad luck because the family's finances or livelihood would just "fly away." Noodles are also a staple. This symbolizes long life. 8. Small clusters of grapes are hung on every window and door of the house. This is believed to welcome in good luck. When I was little, this was my grandmother's task. My cousin and I had the time of our lives standing on stools and grabbing a grape or two when grandma was not looking. Grapes are expensive in my side of the world and New Years was the time for us to indulge. 9. One of the things I also looked forward to when I was a child was the "money shower." My grandparents, great aunts, and uncles would have bags of coins with them and say "Happy New Year!" while throwing a handful of coins for us little children to grab and keep for ourselves. They believed that doing this would mean money will continuously flow into the house. (Just like the Christian virtue of giving and sharing) These coins were considered "lucky" and were not to be spent. Good luck with that! Those coins were soon to be money for candy and chocolate bars. 10. All doors and windows must be kept open at midnight. This is believed to make the good luck come in. In a gated community, this would work, but not in areas where robbery is rampant. 11. At the stroke of midnight, all children are supposed to jump up and down. We were told to take extra effort to jump as high as we can. The reason for this is that it is supposed to make us grow taller. I did believe in this and made sure I jumped like crazy on New Year's Eve. Did I grow tall? Nope. After all those years of jumping when I was a kid, I only grew to be 5 feet 1 1/2 inches. I wonder... if I didn't jump on New Year's eve when I was a kid, would I have been a dwarf? 12. Lastly, it is a rule that no one must be asleep at the stroke of midnight. In my family, even babies are lifted out of their cribs to join in the festivities. The reason for this is supposedly so that no one would be left out in receiving blessings of good luck and good fortune. 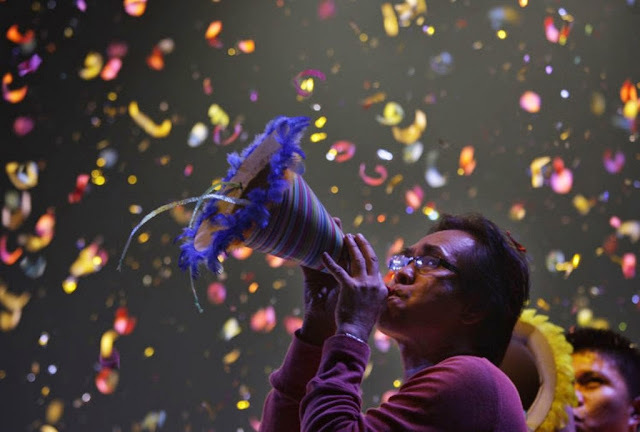 Christmas and New Year's are two big Filipino family celebrations. It is the time to bond with family members we rarely see. It is the season to feast on sumptuous food and share stories about life. It is giving, sharing and togetherness. It is all about smiles, laughter, and cheer.. even if I have to wear polka dots. Have a Blessed New Year everyone! Don't forget to say a prayer of thanks to God for the graces we received for the past year and for giving us the blessing of another New Year! Polka dots to stripes! You really got me with that one! I'm guilty of a number of things in your list, especially jumping high at the stroke of midnight. That didn't make me tall, though. Lol! Happy 2015! For #7, I only heard about chicken and it's because of "isang kahig isang tuka" belief of the oldies! 😂😂😂 Happy New Year mommy Aio! We did a few of these things, but had no idea they were filipino traditions, maybe I'll adopt a few more, as I'm certain my children would love them. :-) Thank you for sharing your culture and traditions with us! It was so nice learning more about Philipino culture! It is always interesting to me to learn about the cultures and traditions of other lands and/or peoples. Thank you so much-I never knew any of that! Wow these are really weird but cool at the same time! Happy New Year! Interesting post! My tradition is to make a resolution for the coming year. My resolution is not to buy any toys or books for my kids. We have too many toys and can get any book we want from the library. There are some traditions in this list that my family no longer does but what's been a must all these years is to welcome the year with family and we all have to be at home. Interesting traditions. I've never heard of most of these. we don't wear polka dots anymore and when i have read that my lucky color would be yellow, we opt to wear one since it says that red will not be auspicious for me. Wow! I didn't know there were so many traditions and ways to bring good luck and money in the New Year. These traditions are very interesting. I love learning about the cultural traditions of other countries. I think we all have strange or weird traditions regardless of where we are. It makes celebrating New Year more fun, don't you think? I did not know that polka dots represented wealth? Why is that? For how strange some of these sounded, they make complete sense. I should start carrying change in my pockets. I missed celebrating the New Year in the Philippines. I still follow the food preparation. I have to make sure that our table has enough food. Now I know the reasons behind our traditions :) I love the idea of wearing stripes than polka dots. Some of these traditions makes sense to me! Its interesting to see what other cultures do for the New Year. In my culture we have a tradition to have soup Joumou which symbolize freedom. Thank you for sharing about these traditions. It's always interesting to learn about other cultures and countries.